In need of affordable, low cost granite kitchen countertops for your new bespoke home project? Need the support of an established, leading and trusted local company who will design and install the best granite kitchen worktops and granite covers for kitchen worktops in South East London? Pure Quartz are specialist suppliers of black granite kitchen countertops, grey granite kitchen worktops and more besides – granite kitchen top colours, dark or light, black or white or grey – you choose. We’ll set you an affordable and reliable tariff and a quote you can depend on. Buy custom granite kitchen worktops UK homes are snapping up and you won’t have to pay until you’re completely satisfied. Installing natural granite is smooth and easy – and what’s more, our company offer the best quality natural stone across a huge range of suppliers and experts. From Samsung white granite kitchen worktops to Santmargerita granite kitchen countertops, we will work closely with you to find that ideal look and feel which won’t upset any budgets. We love what we do – and we will pass savings on cheap granite kitchen worktops to you wherever we possibly can. We offer a local, ‘near me’ approach to installing granite countertops in South East London and beyond. Whether at a discount or at a naturally low cost, you will always receive the best quality white granite kitchen worktops and a variety of other colours and finishes for your needs and desires. Let us find a look and feel that fits your existing décor and your personality – as well as your tastes and aesthetics! Granite kitchen worktops prices don’t need to escalate – early on in the design and ideas process we will be able to draw up a reliable quote with you so that there are never any nasty surprises. A granite kitchen deserves to be affordable and spectacular. 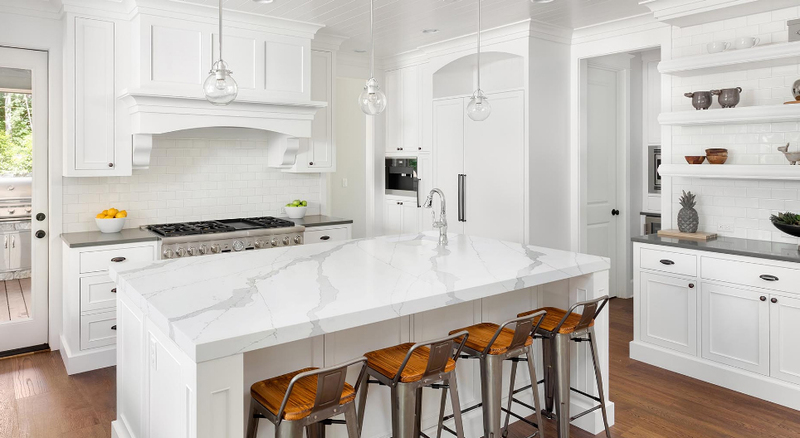 There’s a reason why so many homes are opting for great-looking natural quartz, stone and more besides. We are proud to be a leading source of long-lasting granite for kitchens, bathrooms, wet rooms, offices and even floors. Come and let us take a look at your new home plan or refurbishment project and find you the best possible options for real, natural granite. Pure Quarts are experienced experts in designing, fitting and caring for the best quality granite for kitchens, bathrooms and more. This means that when you buy new granite kitchen countertops from our suppliers, you receive stunning natural stone, dutiful aftercare and incredible value. We’re not happy until you are – buy granite marble countertops for your kitchen today and pay once everything is up and running. Why not call us to get a free quote? Dial 01233 733111 or email us with information on your project needs and requirements. Together, we will find that perfect look for you and your family – in marble, granite, quartz or otherwise – why not take a closer look at some of our previous projects, too?